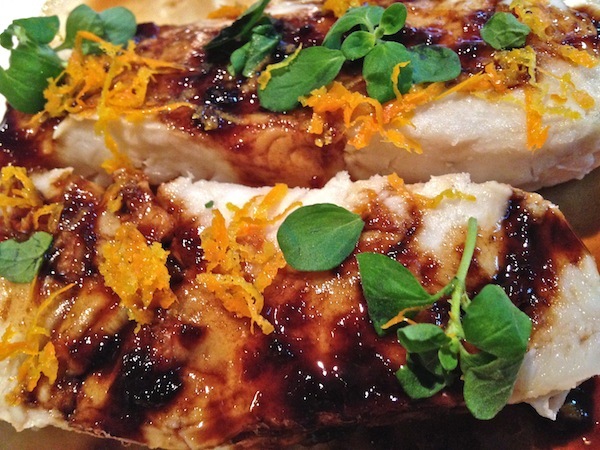 Poached Hake With Orange-Molasses Glaze | Keep It Up, David! 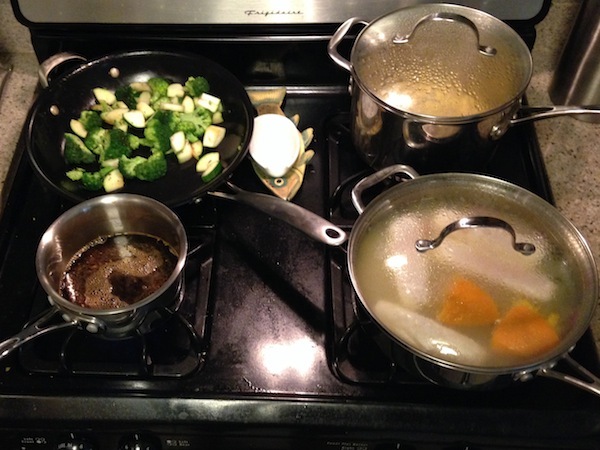 I cook a lot, but I very rarely fire up all four burners on my stove at the same time. One recent meal, though, required all four, and while juggling so much cookware was a handful, the end result was magnificent. 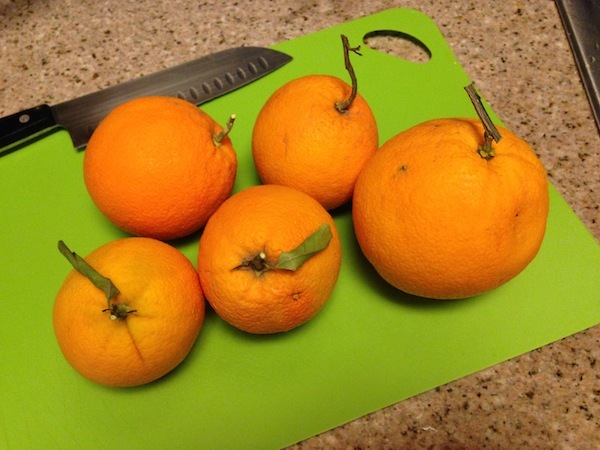 I built the menu around one ingredient: oranges. My friend Joanne gave me a bunch of them from her tree, and they’re delicious. 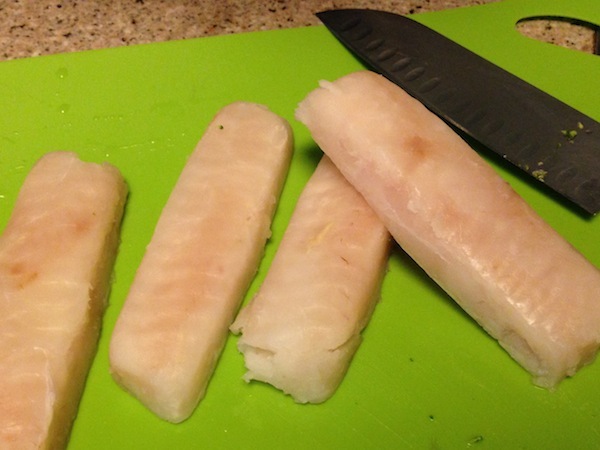 Since my poached chicken dish was so successful, I wanted to try to poaching fish. 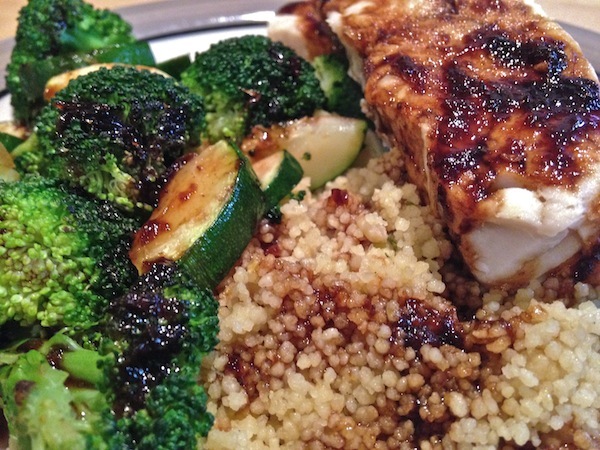 I had hake in the freezer – perfect! I moved some to the fridge the day before so it could thaw. 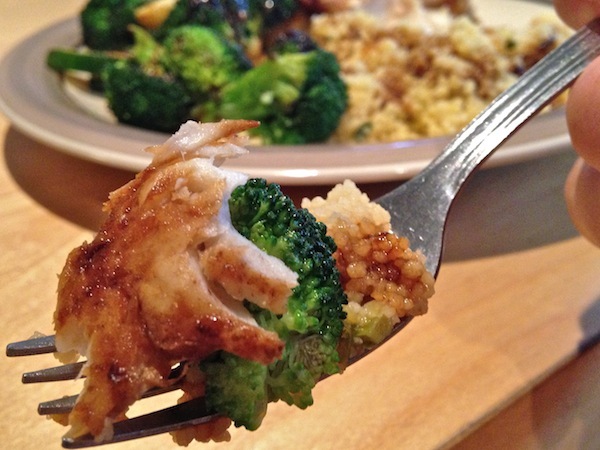 Hake is a flaky, steaky whitefish. I had never eaten it before, but thought it would hold up well to poaching, since it was so thick. 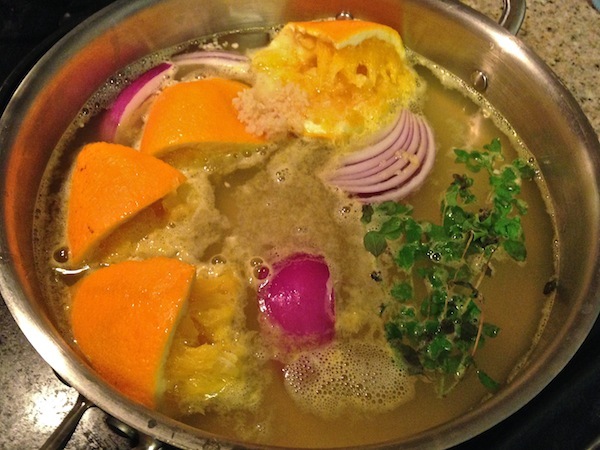 I brought it to a rolling boil to get all the flavors incorporated, and then brought it down to a light simmer. 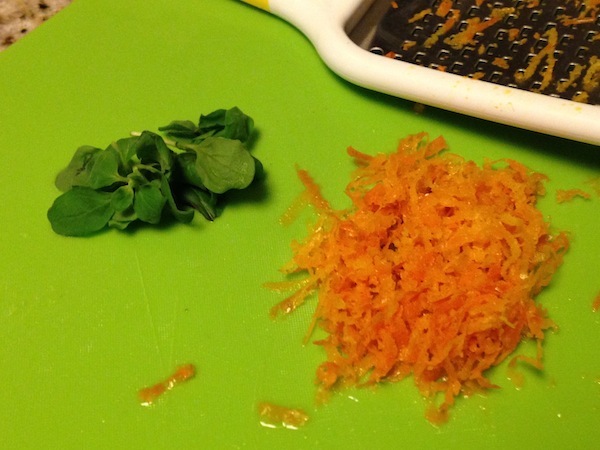 I had to remove a couple of the orange rinds to make room for the fish. Veggies. 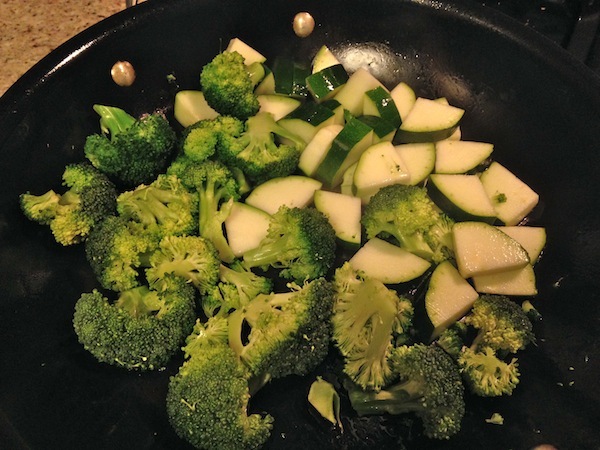 I chopped 1/2 of a large zucchini and 1 broccoli crown, and sauteed them in a non-stick skillet with a little Pam, and nothing more. Couscous. From a box. It was Toasted Pine Nut-flavored (Near East brand), so it was already seasoned. It called for 1.25 cups of water, but since I wanted the use orange throughout the meal, I replaced 1/2 cup of that with fresh orange juice (the juice from one orange). I also only used 1 tablespoon of oil instead of two, but apart from that, I followed the instructions on the box. 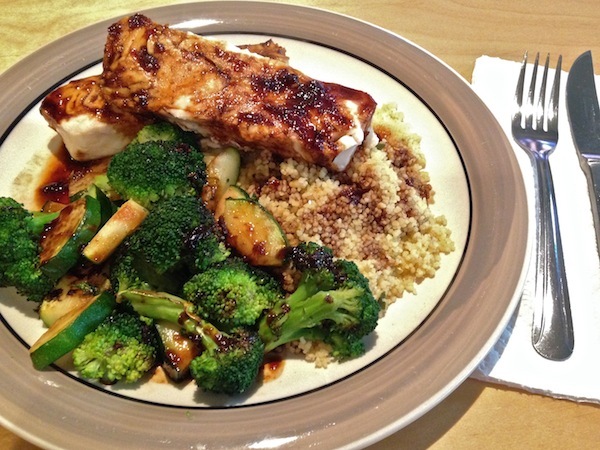 RELATED CONTENT: Check out my recipe page for all sorts of healthy meal ideas! Glaze. I created a glaze that could go on all three components, and the glaze was simple. Only three ingredients! 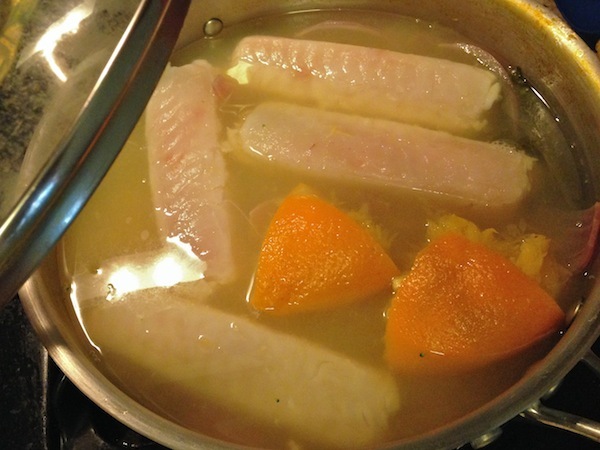 I combined them all in a little saucepan, brought it to a boil, and let it reduce until it thickened up a little bit – about 10 minutes, which was approximately how long it took the fish to cook. …and tasted even better in my mouth. I got so excited to eat that I forgot about my garnishes! I was gonna sprinkle a little orange zest on top, along with the last few fresh marjoram leaves. Oh well. The meal was pretty enough without them, and definitely not lacking in flavor. My favorite part was that even though I used orange throughout the meal, it ended up being pretty subtle. I loved the orange undertones in the couscous, especially paired with the nuttiness of the couscous, and the glaze was sweet, acidic, thick, and a touch bitter – wonderfully complex. It was a good sauce for the hake. While mine was perfumed with the ingredients from the poaching liquid and covered in that great glaze, I could tell on its own it’d be a pretty boring, bland piece of fish. I ate two fish fillets for dinner, and had two more for leftovers. I saved those unused garnishes, as well as the last bit of glaze, so my lunch the next day looked pretty gorgeous, too. This entry was posted on Wednesday, February 11th, 2015 at 12:18 am and is filed under Uncategorized. You can follow any responses to this entry through the RSS 2.0 feed. You can leave a response, or trackback from your own site.